on March 16, 2014 at 12:10 am Secret Videotape of Obama Cabinet Meeting Unveiled! I was able to tweet this, but I have tried several times to post to Facebook without success. Is anyone else having this problem? An irony. Keynesian economics is simply, obviously, laughably wrong. So, the ordinary person assumes that learned economists must be horribly misrepresented. Those criticisms must be political smears by Republicans who want to limit government spending, to keep the working class down, and to somehow preserve their own ill-gotten gains. It is not enough to point out the simple absurdity. The criticism must be backed up by understandable detail showing exactly how Keynesians go wrong. The link below is an effort toward that. I show how an error in logic leads to laughable results. Put simply, Keynesians write down a correct equation representing a true relationship, then interpret the relationship backwards to get insane results. The math is good, but the conclusion goes against cause and effect. Rain Illogic. TRUE: When it rains, the streets of the city become wet. TRUE: When the streets become wet, it is almost always raining. FALSE: Making the streets wet almost always causes it to rain. Keynesian Illogic. TRUE: A growing economy (more jobs, work, and production) increases consumer spending. TRUE: Increased consumer spending almost always means a growing economy. FALSE: Intentionally increasing government and consumer spending will almost always result in a growing economy. Mathematics is only an aid to thinking. It represents quantities in a way which can be easily written and combined. The results can suggest more things to think about. Physicists know that their mathematics is almost always a simplified model of reality. They are dismayed but not surprised to find that an equation makes bad predictions. They always compare their expectations to reality to correct inevitable mistakes. When in doubt, they distrust the math, not reality. 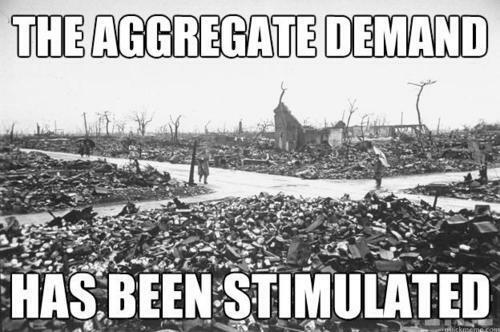 The commonly taught and usually believed Keynes Multiplier is probably the most destructive piece of false economics. It provides support for government borrowing and spending regardless of the merits of the project. The act of spending is supposed to create more wealth than the wealth wasted by the spending. So, why not spend big? But, the commonly taught derivation is laughably illogical, not merely a bad estimate. Mises tops Keynes every time. How could any THINKING person disagree?